[S6] G.E. Cokayne; with Vicary Gibbs, H.A. Doubleday, Geoffrey H. White, Duncan Warrand and Lord Howard de Walden, editors, The Complete Peerage of England, Scotland, Ireland, Great Britain and the United Kingdom, Extant, Extinct or Dormant, new ed., 13 volumes in 14 (1910-1959; reprint in 6 volumes, Gloucester, U.K.: Alan Sutton Publishing, 2000), volume III, page 474. Hereinafter cited as The Complete Peerage. [S6] Cokayne, and others, The Complete Peerage, volume III, page 475. Robert Henley, 1st Earl of Northington was born in 1708.2 He was the son of Anthony Henley and Mary Bertie.3 He married Jane Huband, daughter of Sir John Huband, 2nd Bt. and Rhoda Broughton. He died in 1772. 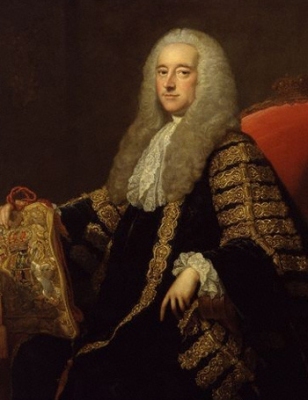 He held the office of Lord Chancellor between 1761 and 1766.4 He was created 1st Earl of Northington in 1764. Her married name became Coventry. After her marriage, Peggy Pitches was styled as Countess of Coventry on 3 September 1809. [S6] G.E. Cokayne; with Vicary Gibbs, H.A. Doubleday, Geoffrey H. White, Duncan Warrand and Lord Howard de Walden, editors, The Complete Peerage of England, Scotland, Ireland, Great Britain and the United Kingdom, Extant, Extinct or Dormant, new ed., 13 volumes in 14 (1910-1959; reprint in 6 volumes, Gloucester, U.K.: Alan Sutton Publishing, 2000), volume III, page 475. Hereinafter cited as The Complete Peerage. Sir Abraham Pitches was a brandy merchant.1 He lived at Streatham, London, England.2 He lived at Streatham, Surrey, EnglandG.1 He was appointed Knight. From 29 June 1792, her married name became Cotton. Sir Willoughby Aston, 5th Bt. Children of Elizabeth Cotton and Sir Lynch Salusbury Cotton, 4th Bt.